I've Returned (with Fermented Pickles)! I’ve Returned (with Fermented Pickles)! Josh and I have a favorite restaurant in Denver that we frequent at least two or three times a month. It’s called Freshcraft, and they’ve got a menu chock-full of delicious, handmade foods and a craft beer tap list that would make any beer geek’s head spin. My favorite menu item is “The Burger”—a half pound of beef on baby arugula, topped with Gorgonzola and caramelized onions, served with a side of house-made aioli. My mouth is starting to water just thinking of it. Josh’s favorite is the Cheese Crusted Iowa Style Pork Sandwich, which comes out as a giant slab of pork tenderloin, breaded and fried in what tastes like homemade Cheez-Its, served on a teeny-tiny bun with a side of house made hush puppies. Not to say that doesn’t sound delicious, but holy carbohydrates is it loaded with starch and not-so-paleo-friendly ingredients. I’ve always been tempted to just get one of my own, but could never bring myself to try such an abomination without feeling like I’d have to climb a mountain afterward to expend that sudden spike in energy. Just last night, however, in a rush to find something quick and easy to make before meeting some friends for Happy Hour, Josh suggested I cook up some pork chops on the stove. As I looked around to try and figure out how to prepare them, I found a bag of chicharones, a giant meat mallet, and a Kerr jar full of bacon fat. So, what did I do? I decided to try my hand at making my own paleo version of an Iowa-Style Pork Tenderloin at home, and I’m here to share the love with you. In a bowl, crack and stir the two eggs together. In another bowl, mix the crushed pork rinds, the salt, the crushed red pepper, garlic powder and coarsely ground pepper together. 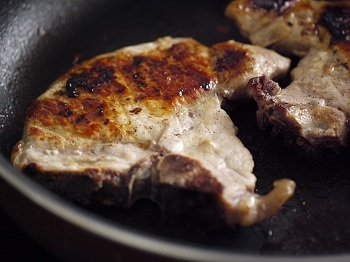 Using a meat tenderizer, flatten each pork chop until it’s no more than ¾-inch thick; if you can, use a tenderizer with the pointed side and a flat side—smash it down with the pointed edge, then flatten completely with the flat edge. Melt the bacon fat in a large pan on medium-low heat. As the fat is melting, coat each pork chop first in a layer of egg, then in a layer of the pork rind mixture. Put the chops into the melted fat and cook for 7.5 minutes on each side. Add additional seasonings to taste. Serve hot with a dab of dijon mustard and enjoy! If I can be completely honest with everyone for a moment, I’d just like to say that I think science is pretty awesome. Oh, what? You do too? Excellent. Now we can definitely be friends. Know what else is awesome? Pancakes. That’s right—science, and pancakes. So what if I told you that the two can be married in a wonderful ceremony and make fluffy, delicious pancake babies without using dairy, flour or sugar? Yes, friends, it can be done! After a bit of research yesterday, I finally figured out how to do it. You see, this may or may not as super exciting to the rest of you as it is for me. 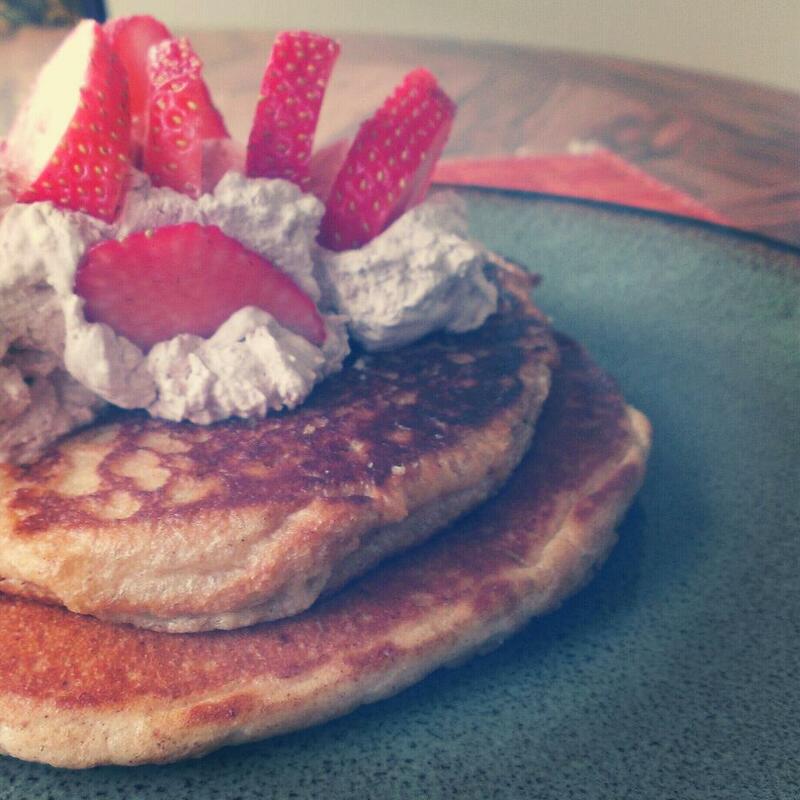 For the first 7 months of eating paleo, I tried time and time again to create an original recipe for pancakes that would come out as fluffy and delightful to eat as the bleached-flour, corn-syrup-soaked alternative. Up until this point, I failed (sometimes quite miserably) and was almost convinced that flour alternatives would never be as good as the real thing. For a well-seasoned baker, the solution to the flat, floppy, dense pancake may seem obvious. But like I said, I like science, and I like knowing why science works, so when I set out yesterday to figure this thing out, I was so pleased to find that the solution was, in fact, quite simple. What was it? Baking soda! Duh! When baking soda interacts with something acidic (like the buttermilk in buttermilk pancakes) it creates carbon dioxide, which gives pancakes their wonderful little air bubbles. As an alternative, many bakers use baking powder, which is a mixture of sodium bicarbonate (baking soda) and cream of tartar—it gives breads and other baked goods their fully qualities without the use of yeast. Another interesting thing about baking soda is that it changes the browning properties of a food as it cooks. Without any, a pancake will fall flat, dense, and very light in color. Too much, and you’ll get a deep brown pancake with the taste of unconverted baking soda. Mix all of the dry ingredients (Almond flour, baking powder, baking soda, salt, stevia) together in a medium-sized mixing bowl. Make sure they’re all thoroughly mixed together. Add the wet ingredients (almond butter, eggs, coconut milk, softened honey and melted coconut oil) and stir well. I used a hand blender to make sure everything was mixed appropriately and no nut butter or coconut oil chunks were left behind. Heat a well-greased pan (grass fed butter or coconut oil) over medium heat. Using a 1/4 C. measure, dollop out the batter onto the pan and cook for about 1 minute on each side, or until bubbles start to form and pop on the top of the wet batter. I made my pancakes quite a bit larger, so those took 1.5-2 minutes on each side. Serve drizzled in honey and cinnamon, or if you’re feeling adventurous, whip up a batch of homemade whipped cream and serve with berries on top! I love Indian food. The unfortunate part of this is that when it comes to restaurant Indian food, it’s often loaded with things that aren’t exactly paleo-friendly: rice, rice flour, potatoes, lentils and wheat-based products, like naan. Delicious, buttery naan. Mmmm. Anyway, I was craving something a little exotic the other night but wasn’t willing to brave the cold or spend the money on something I could just as easily make at home. 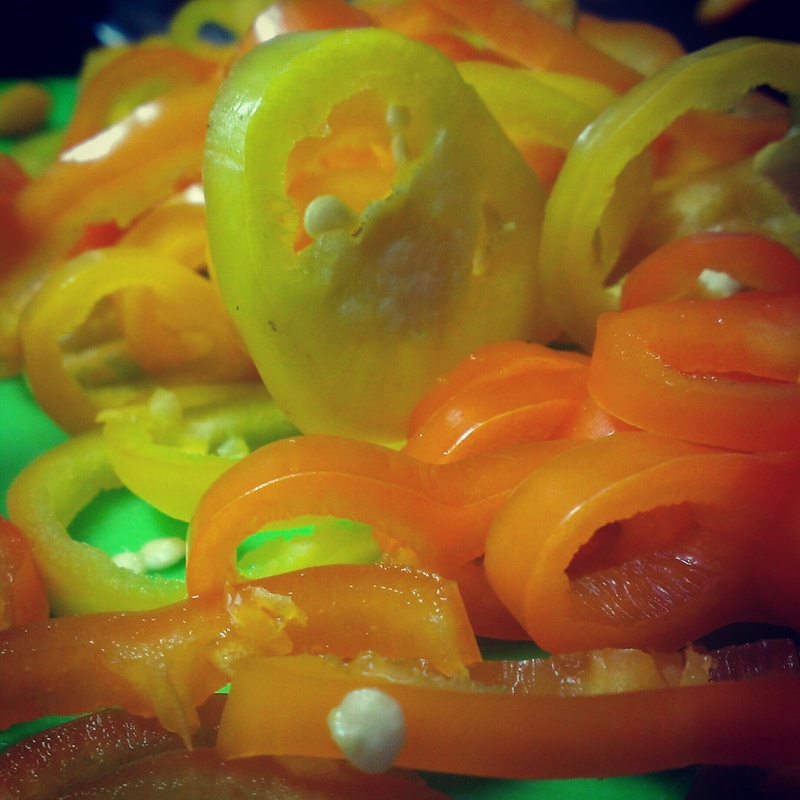 After rummaging through my fridge for several minutes, I came out with a bag of sweet peppers, some chicken and an onion that needed some attention fast. I got busy chopping up my ingredients and pulled all the spices out of the cabinet before I finally realized: I’ve never actually made curry before. Of course, that didn’t stop me. I mean, who hasn’t heard of the internet? I quickly looked around at similar websites, gathered a few ideas and came up with this mash of a recipe. If I can be completely honest, I think it came out awesome. Then again, I really wanted curry that night, so I might be biased. In a large pan over medium heat, melt the coconut oil and cook the chicken in the oil until it’s about halfway done. Add in the sliced onion and peppers. Sauté lightly. Add the curry powder, garlic, red pepper and salt. Stir well, until the chicken and veggies are completely coated. Let that cook for another 3 minutes on medium-low heat. Add the coconut milk and chicken broth, stir well, and turn the heat down to low. Let it simmer for approximately 30 minutes. Add in the cilantro and a dash of cinnamon. Stir it in, and let it simmer for another 10 minutes. I served my curry with a side of one of my absolute favorite dishes: oven-roasted Brussels sprouts. I guess we’ll consider it a culture clash! At this point I get thrown a couple of odd looks and disbelieving laughter, and then continue to eat my cobb salad as they munch on their Subway sandwiches. 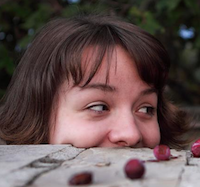 In reality, though, I think there exist a good amount of misconceptions about the way we cavepeople and ketoers eat. When people in my office see me bring in a Ball jar of coffee topped with a layer or coconut oil, or when they see me eating a giant salad with bacon, avocados, blue cheese and olive oil, they think I’m stuffing my veins with loads of unhealthy, artery-clogging fats that will leave me face-down on the break room floor. They then proceed to sneak away timidly with their quinoa cakes and gluten-free pizzas. Most of the time, I just laugh it off. Sometimes I wish I could evangelize the paleo way, but that’s not really my style, and it’s truly a personal choice when it comes to what we put in our bodies. As such, Josh and I have become increasingly aware of how much meat we eat, and the quality of the meats we’re eating. This has led us to seek out larger portions of side dishes, primarily vegetable-based dishes that can be roasted, grilled or sautéed. Hence, today’s featured recipe: Oven-Roasted Brussels Sprouts with Fennel and Onion. This delicacy has a bunch of wildly aromatic flavors that blend perfectly. The “greenness” of the Brussels blend into the delicate licorice taste of the fennel and the sweetness of the onions. Overall, I think this is one of the best side dishes for cold winter nights, and can be converted for both bacon lovers and vegetarians alike. Cut off the tough, stalky ends of the brussels and cut the little bulbs in half. Cut the stems with the leaves from the fennel bulb and set aside; slice the bulb into quarters, split the individual layers apart and slice those layers into strips. Put all of the cut veggies into a mixing bowl and take half of the leaves from the fennel stalks and mix them in with the veggies. 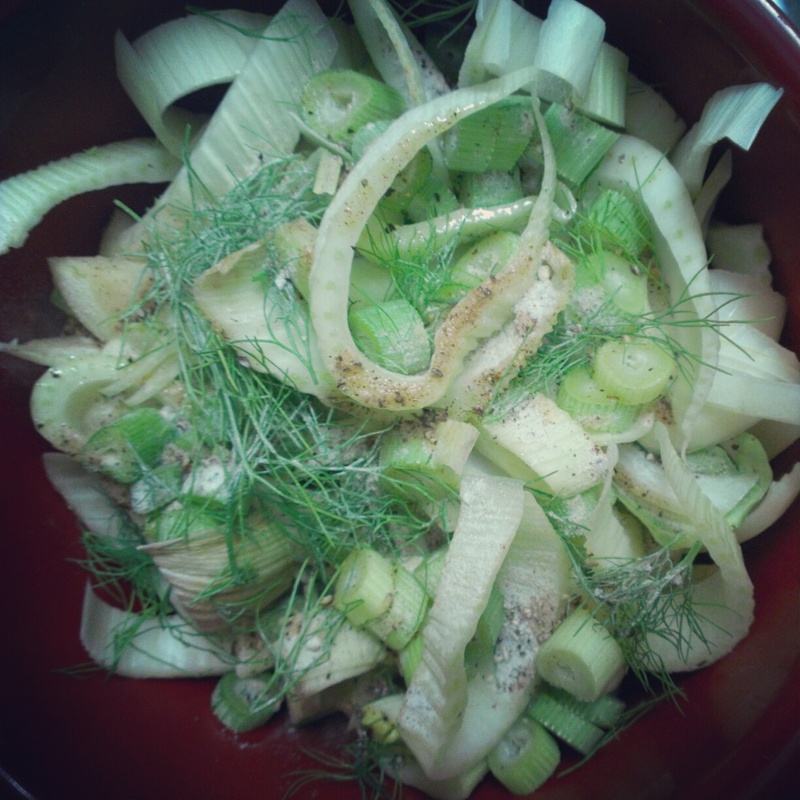 Cut up the stalks from the fennel into little rounds and place them into the bowl. If you’re using bacon, cut the cooked slices into thin strips and place them in the bowl. Take your fat of choice and dump it into the bowl. Add the pepper and salt to the bowl and mix the veggies up thoroughly so they’re all evenly-coated. On a roasting pan covered with aluminum foil, spread the veggies evenly so that all have equal exposure. Take the rest of the fennel leaves and spread them on evenly on top of the veggies. Roast the whole pan for 40-60 minutes. The brussels should get crisp and browned, the onions lightly caramelized and the fennel soft. If you added bacon, it should be nice and crispy. Happy Friday to everyone! I hope everyone had a fantastic Valentine’s Day filled with dark chocolate, red wine and big, juicy steaks. As a treat last night, Josh came home with a new Emerilware© cast iron skillet, some wild-caught swordfish, capers, fresh lemons and a mini jug (yes, jug) of paisano. As evidenced by our fuzzy heads and tender stomachs this morning, I think we had a pretty good Valentine’s Day. Whenever I’m feeling a bit woozy, there’s not much else that makes me feel better than greens. And coffee. Coffee makes me feel better pretty much all of the time. One of my favorite recipes for greens these days—and one that I’d like to share with you today—is sautéed rainbow chard with onions, a bit of bacon and some crushed red peppers. It’s a variation of the collard greens I typically make during the summer and fall months, and super easy to make. Chard just makes me feel all warm and fuzzy inside, so I hope it does the same for you. In a large pot over medium heat, melt the butter and add the garlic and onion slices. Stir them occasionally to keep them from burning or sticking to the bottom of the pot. As the onions and garlic sauté, cut the stems from the chard and slice them into 1-inch pieces. 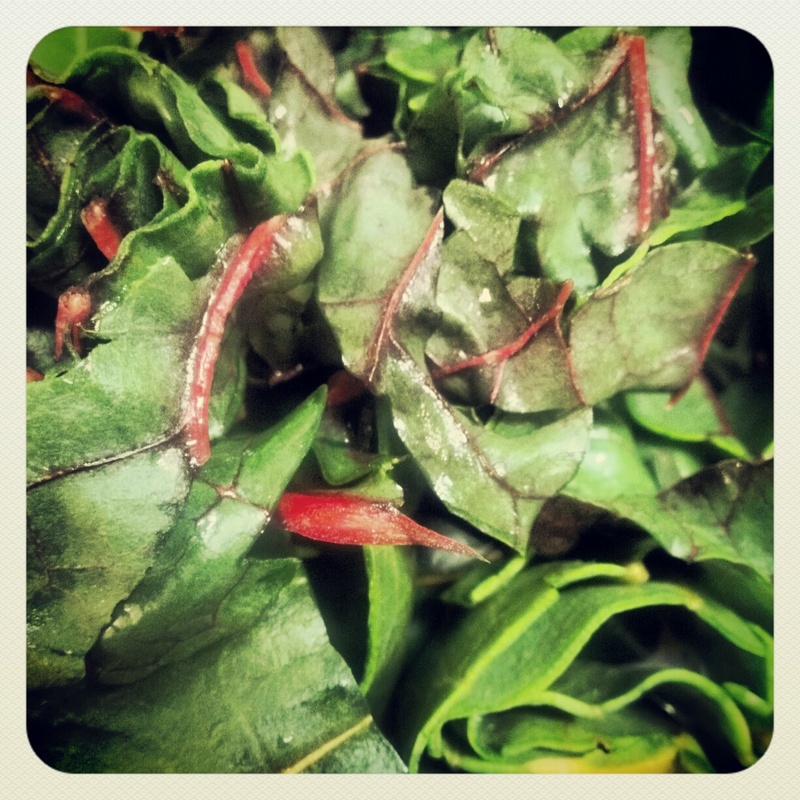 Roll the chard leaves into little leaf burritos and chop them up into 1-inch strips. Set the leaves aside. Add the chard stem pieces to the sautéed onions and garlic and stir well. Coat the chard in the butter—add more butter if it looks like the chard is burning or sticking to the pot. Add in as many or as little pinches of red pepper flakes as you like and stir it in well. I personally add about two shakes from our big Costco red pepper bottle, though I know Josh always prefers more. 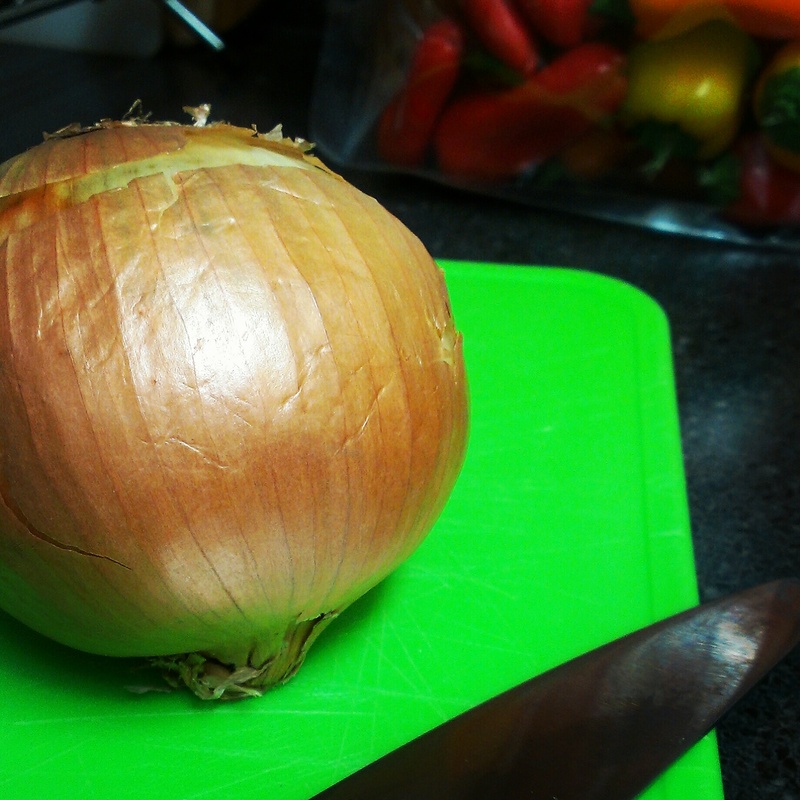 Let the stem pieces cook for about 3 minutes with the onions. They should change color very slightly and look more translucent around the edges. Add the stock and salt into the pot and stir again. Finally, add the chard leaves. Cover the pot and let it cook for about 15-20 minutes, or until the leaves are lightly wilted and a nice, dark green. I wanted to make some semblance of a normal birthday cake for Josh, as yesterday was his 24th birthday and he was stuck in his office all day and really, who doesn’t get at least a little cheery at the thought of birthday cake? The recipe I found is a vanilla-flavored cake made with almond flour, coconut oil and a little bit of lemon juice. It comes from Comfy Belly. Mine came out moist and spongy, albeit a bit dense, and it was absolutely fantastic with a light frosting of homemade whipped cream (1/2 C. heavy cream, 1 Tbsp vanilla and sweetener to taste, whipped together until thick and whipped-creamy). I decided to make two separate batches: one as the recipe reads, and another with added coco powder. 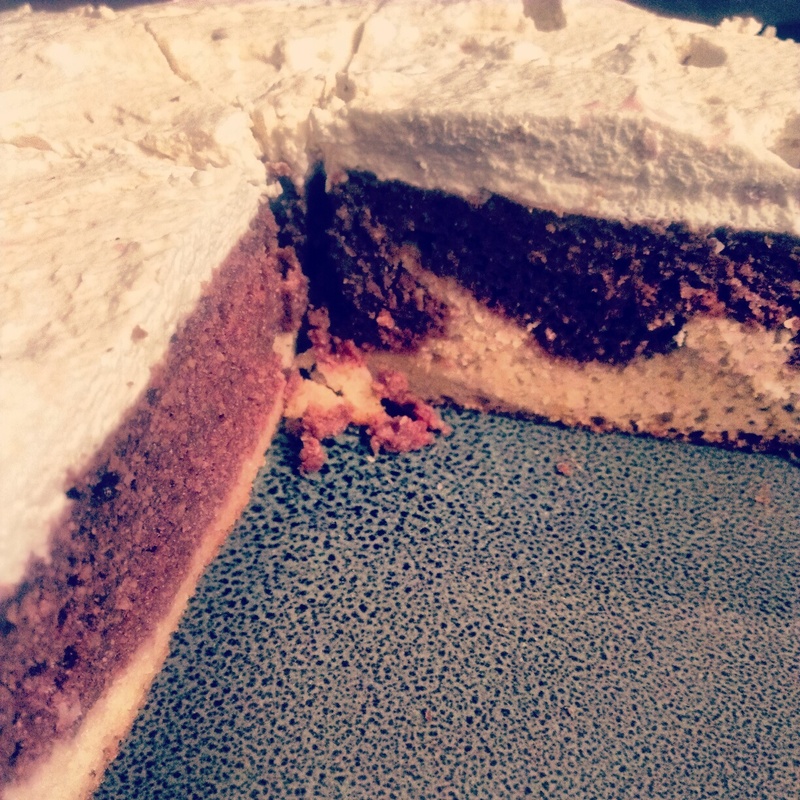 I then combined them in the pan and got a really nice marbled cake. 2. Prepare an 8 inch spring-form pan (or a round cake pan) with a circular piece of parchment paper to place on the bottom of the pan. This allows you to remove the cake from the pan without it sticking. To yield the circle size I need, I place the cake pan on a piece of parchment paper and trace a circle around the pan. 3. Separate the egg yolks and whites. Place the yolks in a separate mixing bowl, and then beat the egg whites with the vinegar until it’s just starting to get bubbly and soft peaks form. 4. To the yolks add the honey, baking soda, oil, vanilla, and whisk to blend well. 5. Add the lemon juice to the egg yolk batter and whisk to blend well. 6. Fold the whipped egg whites into the yolk mixture, and then finally add the almond flour to the batter and whisk to blend well. 7. Bake for about 20 minutes, or until the center is not soft and a toothpick inserted in the center comes out clean. 8. Optionally, you can invert the cake when it comes out of the oven in order to retain it’s height, and then once it’s cool run a knife along the sides to remove it from the pan. Otherwise, cool the cake and run a knife along the sides and remove the cake from the pan. If you’re using a spring form pan, you probably won’t need to run a knife along the sides. Happy Wednesday! 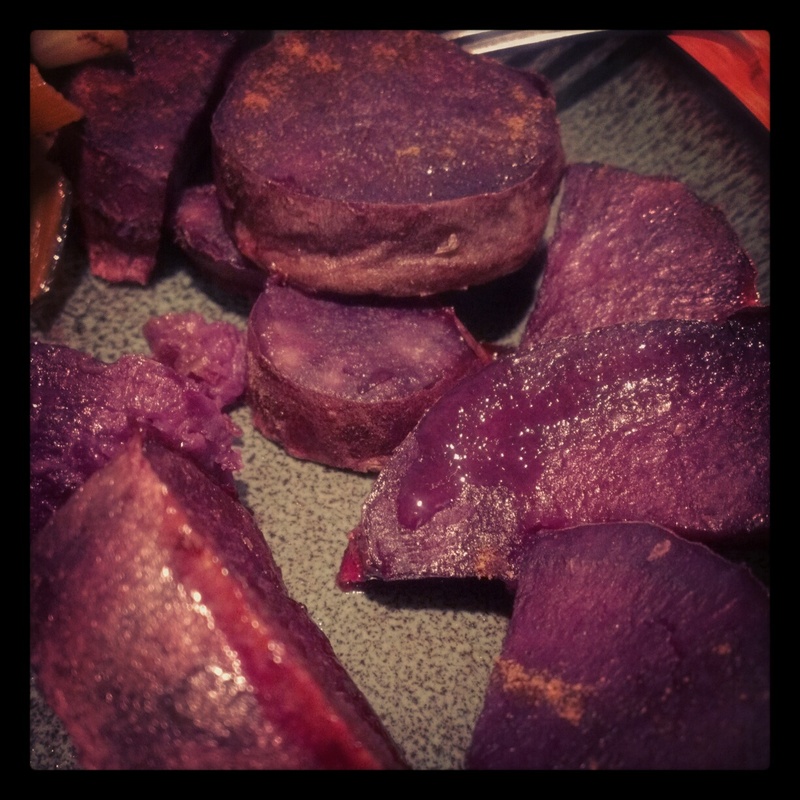 I’m here with a brief progress report and a featured recipe that I just can’t get enough of: oven-roasted purple sweet potatoes. First, a progress report. As you may have seen in my last post, I finally broke through my plateau by cutting alcohol out of my diet. I was going through a nasty bout of some bug for about 3 weeks during the holidays, which stunted my exercise efforts and made me crave good ol’ comfort foods (though I had an answer to that problem). Nevertheless, once sickness had passed and I figured out what I needed to do, I dropped several pounds and started feeling back on top of my game. Oh, but it doesn’t stop there… I’ve lost even more! Since my post about a week ago, I dropped below the 180 line and have managed to fit comfortably into several older pairs of pants that had been too small for me for the past two years. I’ve also started running again, and managed to complete a walk-run 5k in 45 minutes. It’s a great feeling, folks. I’m hoping that by the time my wedding rolls around, I’ll be under 170 (I’m about 7-8 pounds away) and a lot more comfortable showing off my arms and back. Heck, maybe I’ll even be able to run a 5k without stopping. Who knows? So, all you need to do is cut those potatoes up into circles about 1-inch wide. Melt the coconut oil and toss the potatoes with the oil in a mixing bowl. Sprinkle in a tiny amount of cinnamon, just enough to get a bit on each piece. Wrap the potatoes in tinfoil, then bake in the oven for 1.5-2.0 hours. They’ll get extremely moist and lightly fragrant. Once they’re out of the oven, coat them lightly with cinnamon, serve and enjoy! Enter your email address to follow The Primeval Tongue and receive notifications of new posts by email. Thanks so much for stopping by! My name is Megan, and I love food. Like, a lot. 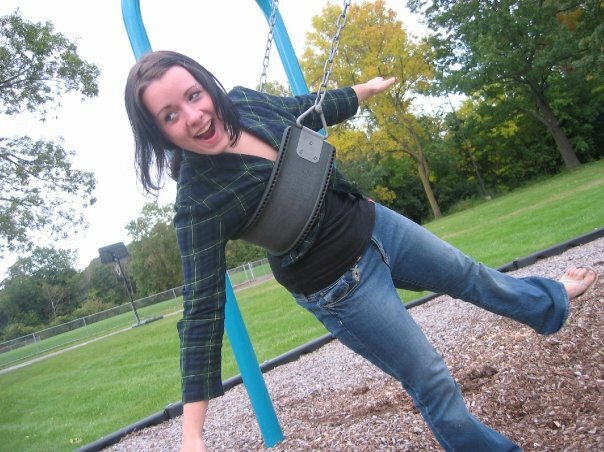 When I started this blog, it was mostly as a way for me to document my transition from the SAD diet to keto. Now that I've made the full switch to paleo, I couldn't be happier with how my body feels. And I still get to eat bacon and chocolate! Isn't life great?